I recently published an op-ed on The Telegraph, focussing on an aspect of the election debates conspicuous by their absence. Notably, net neutrality. The rise of #Milifandom and an army of memes in the election debate are a welcome diversion from the tightly controlled social media campaigns conducted by all parties. But however hilarious Ed Miliband as James Bond might be, our current crop of political hopefuls have paid little more than lip service to digital issues set to reshape our society, business landscape and relationship with Europe. As I embarked on my quest to turn Miss Misa into a werewolf, I encountered an unexpected glitch in her transformation. I captured the result on video. I'm happy to report that since leaving the presence of Hircine, she has returned to normal. Ripping open a FedEx package that's journeyed from the United States to the leafy pastures of Ealing Broadway in London is always satisfying. More so today when I discovered it contained an advanced copy of Bethesda and Titan Books' debut Tales of Tamriel lore guide. Like previous releases, such as those pictured on my Elder Scrolls gaming room floor above, this new book presents text that will alienate those not familiar to the fantasy world of Nirn and Tamriel. It's a book that combines lore scribed within the in-game books, albeit in a format suitable for reading in a coffee shop. 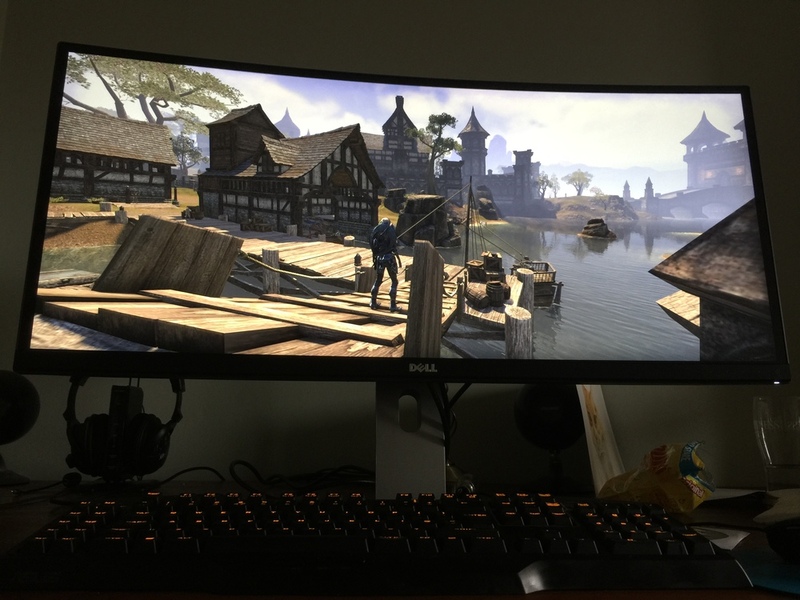 After buying my new ESO gaming rig (and it pretty much is exclusively used for The Elder Scrolls Online), it was time to decide on a new monitor. I'd reviewed the Asus 4K model and had to decide whether to buy one of those or plump for something else. My inherent compulsiveness kicked in and I bought Dell's 34-inch, panoramic 21:9 aspect ratio curved monitor (the Dell U3415W, or 210-ADYO as it was called on Amazon). I have to be honest: for gaming I prefer this to the 4K review unit it replaced. I was given a very fun surprise in the form of a hand-painted wooden peg doll version of my main Elder Scrolls Online character, Miss Misa. This was a gift from my girlfriend who runs a store that produces custom-painted wooden versions of people and characters for weddings, birthdays, anniversaries and other occasions. She has started to offer game characters, particularly aimed at role-playing game fans who want hand-painted dolls crafted of their in-game characters. If you'd like a custom version of your in-game character creating, you can order one through the DreyerDraws store on Etsy. All hand-made in London, with love!